"The Fragrance of Life," Sermon Seeds, etc, Kathryn M. Matthews, 2019. The Adventurous Lectionary, Lent 5, Bruce Epperly, Living a Holy Adventure, 2019. "The Sweet Smell of Faithfulness," D Mark Davis, raw translation and exegesis/questions, Left Behind and Loving It, 2013. The Lectionary Lab, Lent 5C, the Rev'ds Dr. John Fairless and Delmer Chilton (aka "Two Bubbas and a Bible"), 2013. Lectionary Lab Live podcast. Rumors, for March 21, 2010, Ralph Milton, "Sermon helps for preachers with a sense of humor." Jesus Now, Lent 5C. Lectionary, study and worship resources from Faith Futures Jesus Then & Now. "Perfume and Poor," discussion and commentary, RevGalBlogPals, 2019. 11th Hour Preacher Party. "God's New Thing," Glenn Monson, Law and Gospel Everywhere, 2019. A Provocation, Isaiah 43:16-21, Richard Swanson, Provoking the Gospel, 2019. Sacredise Worship Resources, John vandeLaar, 2019. "An Uncomfortable Meal," Patrick Faulhaber, Modern Metanoia, 2019. "Me, Too," Carrie LeRoy, Journey with Jesus, 2016. The Preacher's Study John W.B. Hill, The Associated Parishes for Liturgy and Mission, 2016. Devotion and Deceit, Glenn Monson, Law and Gospel Everywhere, 2016. The Impossible Dream, commentary and discussion, RevGalBlogPals, 2016. "Old and New Ways," Eric Smith, LECTIO, 2016. "Costly: a Life Poured Out," Sharron R. Blezzard, Stewardship of Life, 2016. "I Am about to do a new thing, now it springs forth, do you not perceive it?" Stephen Fowl, Ekklesia Project, 2016. "Anointed for Burial," Bob Cornwall, Ponderings on a Faith Journey, 2016. "A Season of Tears," Larry Patten, 2016. "The Anointing," Andrew King, A Poetic Kind of Place, 2016. "Then and Now," lectionary poetry by Scott Barton, 2016. "'She Did What She Could,'" Lent 5C, Daniel B. Clendenin, The Journey with Jesus: Notes to Myself, Journey with Jesus Foundation, 2013. 2010 guest essay by Mary Graves. 2007 essay by Dan Clendenin. "Remember to Forget," John C. Holbert, Opening the Old Testament, 2013. "Lavish," Sharron R. Blezard, Stewardship of Life, 2013. "Proper Confidence," Robert Cornwall, Ponderings on a Faith Journey, 2013. Lectionary Reflections, Summit to Shore, John Edward Harris, 2013. "Annointed Warrior," Thomas Beam, 2013. "Honouring God's Presence," Neil Chappell, aweirdthing, 2013. "Jesus and the Women," Debra Dean Murphy, Intersections, 2010. "Grace Upon Grace Upon Love," Karoline Lewis, Day 1, 2019. "He's Done So Much for Me," by Carla Pratt Keyes. A Sermon for Every Sunday. Projectable video sermons for every Sunday of the Liturgical Year. "What's the Point?" the Rt. Rev. Robert Wright, Day 1, 2013. "Press On," Frederick Buechner, 2013. "Investing in Life," Walter Brueggemann, "Lent Is 'Come to Jesus' Time," 2010. "The Fragrance of Love," Weekly Seeds, UCC, 2019. Mustard Seeds, "What Really Matters / Looking to the Future/There Is a Pool in the Desert," Lent 5C, 2019. A lectionary-based ideas resource for leaders of contemporary worship, Ann Scull, Gippsland, Australia. Lectionary Liturgies, Lent 5C, Thom M. Shuman, Presbyterian Church (U.S.A.), 2019. Worship Resources, Lent 5C, Rev. Mindi, Rev-o-lution, 2019. "Liturgy: prayer reflection 1", "Liturgy: prayer reflection 2," reflections on the collect at the Eucharist, Rev. Bosco Peters, New Zealand. "Service Prayers for Lent 5," Worship Ways, UCC. Commentary on collect for Lent 5, Bosco Peters, 2016. Clip Art, Lent 5C, Fr. Richard Lonsdale, Resources for Catholic Educators. "What A Waste," video by David J.M. Coleman, 2013. "Whatever Gains I've Had," Text: Carolyn Winfrey Gillette, Tune LEONI 6.6.8.4 ("The God of Abraham Praise"). A new hymn on Philippians 3:4b-14 written for The Presbyterian Outlook magazine for Lent 2013 and available with the music. "Reap Joy," Brenton Prigge, NewHymn. Hymns of the Spirit Three, Lent 5C, Richard E. Hurst, Universalist National Memorial Church. Psalm 126 set to St George's Windsor (77 77 D) by Dale A. Schoening, Metrical Psalms. Hymn and Song Suggestions, Lent 5, 2019, annotated suggestions from Natalie Sims, Singing from the Lectionary. Worship Resource Manual, The Moravian Church, Southern Province. Worksheets for planning music in worship: hymns, anthems, solos, organ repertoire suggestions for RCL texts. Direct link to Lent 5. Choral Anthem Project, Lent 5C, National Association of Pastoral Musicians. Lectionary Hymns, Lent 5C, National Association of Pastoral Musicians. Together to Celebrate, 2019, David MacGregor, Uniting Church in Australia. Contemporary Christian Music resources. Smelly Hand Sanitizer, John Stevens, Dollar Store Children Sermons, 2016. "There's a Prayer for That: Costly Perfume," On the Chancel Steps, children's resources by Frances Woodruff, 2013. "Acts of Loving Kindness," Dianne Deming, Children's Sermons Today, 2013. "Remote Control," video, John Stevens, Dollar Store Children's Sermons, 2013. Children's Sermon, Lent 5C, Faith Formation Journeys, 2013. 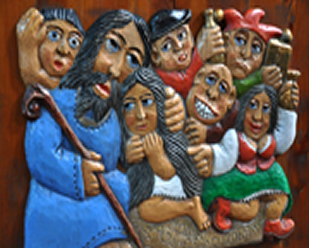 Story for Children's Worship and Family Activity, Lent 5C, at word-sunday.com: A Catholic Resource for the Lectionary by Larry Broding.